We’d love your help. Let us know what’s wrong with this preview of Still Waters by Lindsey P. Brackett. Cora Anne Halloway has a history degree and a plan: avoid her own past despite being wait-listed for graduate school. Then her beloved grandmother requests -- and her dispassionate mother insists -- that she spend the summer at Still Waters, the family cottage on Edisto Beach, South Carolina. Despite its picturesque setting, Still Waters haunts Cora Anne with loss. At Still Cora Anne Halloway has a history degree and a plan: avoid her own past despite being wait-listed for graduate school. Then her beloved grandmother requests -- and her dispassionate mother insists -- that she spend the summer at Still Waters, the family cottage on Edisto Beach, South Carolina. Despite its picturesque setting, Still Waters haunts Cora Anne with loss. At Still Waters her grandfather died, her parents' marriage disintegrated, and as a child, she caused a tragic drowning. But lingering among the oak canopies and gentle tides, this place also tempts her with forgiveness -- especially since Nan hired Tennessee Watson to oversee cottage repairs. A local contractor, but dedicated to the island's preservation from development, Tennessee offers her friendship and more, if she can move beyond her guilt. To ask other readers questions about Still Waters, please sign up. Solid debut set in South Carolina and dotted with southern charm. Main character Cora Ann struggles with guilt from a childhood tragedy. Her friend at the time was a teenager named Tennessee who was also impacted by the tragedy. Still Waters is about forgiveness and facing the end of life. I especially loved Cora Ann's grandmother Nan, such a wise and witty woman. Still Waters is a lovely debut full of Southern charm, heartrending realism, and endearing characters. Cora Anne Holloway is back in Edisto Beach, South Carolina, a place filled with both joyous and tragic memories for her. Her character growth is a joy to experience. The themes of forgiveness and moving on from tragedy shine in this story, and Cora Anne's emotions feel strong and realistic. The setting, especially the beach side cottage of Still Waters, takes on a persona all its own. I felt at Still Waters is a lovely debut full of Southern charm, heartrending realism, and endearing characters. Cora Anne Holloway is back in Edisto Beach, South Carolina, a place filled with both joyous and tragic memories for her. Her character growth is a joy to experience. The themes of forgiveness and moving on from tragedy shine in this story, and Cora Anne's emotions feel strong and realistic. The setting, especially the beach side cottage of Still Waters, takes on a persona all its own. I felt at home there and didn't see how Cora Anne would ever want to leave, but memories run deep for her and keep her running rather than planting some roots. Nan is truly an indomitable spirit, and other than Cora Anne, she is my favorite character. Her wit and wisdom in the face of life's curve balls is admirable. There are several secondary characters that add a lot of flavor and depth to the story. Cora Anne's family feels realistic, full of love and strife, as they handle life's ups and downs. Tennessee Watson is a contractor and works on updates for Still Waters. He's also tangled up in Cora Anne's childhood memories, making their reunion a bit complicated for her at first. I appreciated the romantic aspect of the story, but it truly just adds into the overall plot of forgiveness and freedom from guilt. Each piece of the story adds up to that important truth in a poignant way. Lindsey Brackett’s debut novel Still Waters is poignant, heartwarming, and romantic! The Lowcountry coast comes to life with the skill of Brackett’s writing, and the cast of compelling characters moves right on in to your heart. So much more than a romance, this is a story of family and faith and forgiveness that will settle over your soul like a warm ocean breeze. Cora Anne is a very relatable heroine who will welcome you in to her family and hold open the door for you to Nan’s house and the fam Lindsey Brackett’s debut novel Still Waters is poignant, heartwarming, and romantic! The Lowcountry coast comes to life with the skill of Brackett’s writing, and the cast of compelling characters moves right on in to your heart. So much more than a romance, this is a story of family and faith and forgiveness that will settle over your soul like a warm ocean breeze. And then there’s Tennessee. The man, not the state. Blissful sigh. As Suzie Waltner said – “ A man who has every reason to hate her but continues to show up. To draw her out.” And with Tennessee and Cora’s relationship, the author continues to paint a grace-filled portrait of forgiveness and learning to let go of the pain of your past. Bottom Line: Still Waters is full of great characters, vivid setting, and a sweet story of hope and healing. The romance really acts as a subplot to the bigger picture – of what it means to be a family and how to live with the good, the bad and the ugly of all that defines the word. Fair warning though – you might want to pack your bags and head for Edisto when you’ve closed the last page. Wow. Still Waters was not what I expected at all…and that’s not a bad thing. There is so much depth of emotion in this story it gives one pause. I think my mind is still trying to process everything I read and how I feel afterward. First, I love the issues Cora Anne goes through. Now I know that sounds completely asinine but I liked that this book wasn’t just a light read. It had plenty food for thought in it. Second, the scenery is amazing. Ms. Brackett did an amazing job painting Still Waters co Wow. Still Waters was not what I expected at all…and that’s not a bad thing. There is so much depth of emotion in this story it gives one pause. I think my mind is still trying to process everything I read and how I feel afterward. Third, the ending. I admit it took me a few swipes of my eReader to realize that I had reached the last page and that it wasn’t frozen. I was stunned and a little sad. How could it just be over? I want a sequel or some kind of follow up that will allow me to check in with Cora Anne and Tennessee (hint hint Ms Brakett). Lastly, I enjoyed this novel. The beginning started a little slow for me but I’m glad I kept reading because this novel settled right into my heart. Heartwarming...life-affirming...feels like coming home. Those are just some of the descriptions that came to mind as I read this book. The story centers on Cora Anne, who is reluctantly coming to stay for the summer on Edisto Island with her Nan. Cora Anne hasn't spent much time on Edisto since a tragic event when she was around 10 years old turned it from a fun summer vacation spot to a place of guilt and fear. But Edisto and Nan, along with Cora's childhood friend Tennessee, conspire to make h Heartwarming...life-affirming...feels like coming home. Those are just some of the descriptions that came to mind as I read this book. The story centers on Cora Anne, who is reluctantly coming to stay for the summer on Edisto Island with her Nan. Cora Anne hasn't spent much time on Edisto since a tragic event when she was around 10 years old turned it from a fun summer vacation spot to a place of guilt and fear. But Edisto and Nan, along with Cora's childhood friend Tennessee, conspire to make her reconsider her opinion of the island. The characters and their struggles are believable, and the story (as well as the setting) draw the reader in until you just HAVE to know what happens next. I seriously had trouble putting it down, and I really did care what was going to happen to these fictional people. Also, I want to meet Cora Anne's Nan and eat at Ben's restaurant, even though I don't like seafood. WOW!! Beautiful, powerful, and inspirational!! Full review coming soon!!! Still Waters by debut author Lindsey Brackett was such a delightful surprise and refreshing read. I was drawn into Cora Anne’s plight and feelings in regards to the event that scarred her when she was around twelve years old and how that ghost had followed her into her life. As Cora Ann goes back to the place where she never wanted to return at the bequest of her grandmother, she realizes that she must go back and confront her past. What she discovers are family secrets and love that can help he Still Waters by debut author Lindsey Brackett was such a delightful surprise and refreshing read. I was drawn into Cora Anne’s plight and feelings in regards to the event that scarred her when she was around twelve years old and how that ghost had followed her into her life. As Cora Ann goes back to the place where she never wanted to return at the bequest of her grandmother, she realizes that she must go back and confront her past. What she discovers are family secrets and love that can help her move past all that happened with the one person who was just as affected, if not more by those tragic circumstances- Tennessee (yes he is named after the state). I really like how all the relationships unfolded: Cora Ann and her mother, her father, her grandmother, her cousin Hannah, and most of all her relationship with Tennessee. Grandmother Nan was a wonderful character who just wanted to bring her family back to a place that she loved and was filled at one time with happy memories. Keeping secrets of her own and knowing time is short, Nan wants to see her struggling children and grandchildren find happiness, love, and most of all joy. Tennessee was such a hero and I really enjoyed his pursuit of Cora Ann and trying his best to love her through everything. This is an emotional book. The central themes are familial love and restoration, new love with newfound hope and joy, and learning to forgive oneself. I hope that there is a second planned after this story. I would like to have more of a resolution and more time with these characters. Have the tissues nearby. I received an e-copy of the book for free and I purchased a paperback for my own reading pleasure. I was not required to post a positive review and all views and opinions are my own. Still Waters by Lindsey Brackett is a delightful contemporary Christian novel that deals with love and loss, guilt and forgiveness, secrets and amazing grace. I absolutely adored the warm and welcoming inclusive style of Lindsey Brackett. The characters were all realistically drawn and likable, with their vulnerabilities and insecurities. My favourite had to be Nan, the matriarch, who just wanted the best for those she loves. Traumatic events in the past can loom large in the present if we do not Still Waters by Lindsey Brackett is a delightful contemporary Christian novel that deals with love and loss, guilt and forgiveness, secrets and amazing grace. I absolutely adored the warm and welcoming inclusive style of Lindsey Brackett. Traumatic events in the past can loom large in the present if we do not deal with them. "You can run from a place but your past will still be there." Guilt and burdens we were never meant to bear can weigh us down. We all need to receive forgiveness from the face in the mirror. There are fractured families and a search to belong. Sometimes what we are longing for can be found in a place. It can always be found in a person - and His name is Jesus. The novel is about preparing to die. Death is not to be feared when we know Jesus and when we know other loved ones will be waiting. To look on death as something glorious and to be celebrated, is a wonderful attitude to have. "You're already filling my last moments with grief when you should be rejoicing I'm going home." There is amazing grace in the novel. "We don't deserve the grace that saves... Live under forgiveness." None of us deserve grace. It is a gift freely given. Still Waters was a really uplifting novel. Lindsey Brackett wrote in such a way that my soul was warmed and my heart rejoiced. The novel really 'spoke' to me as characters faced 'real' situations. I loved it. Still Waters is Lindsey Brackett’s debut novel set on Edisto Island, South Carolina. This story will capture your heart and your mind. You won’t be able to put it down. Lindsey does an amazing job capturing the essence of the low country. She doesn’t just paint a pretty picture with her descriptions. Instead, her characters seamlessly interact with the environment, making the setting more of a character than a place. As a native of coastal Georgia, I felt right at home. The story unfolds layer b Still Waters is Lindsey Brackett’s debut novel set on Edisto Island, South Carolina. This story will capture your heart and your mind. You won’t be able to put it down. Lindsey does an amazing job capturing the essence of the low country. She doesn’t just paint a pretty picture with her descriptions. Instead, her characters seamlessly interact with the environment, making the setting more of a character than a place. As a native of coastal Georgia, I felt right at home. The story unfolds layer by layer as the characters learn how their histories intersect and form their present-day lives. In a last-ditch effort to force Cora Anne to face her past and heal from her unwarranted guilt, her grandmother Nan bribes Cora Anne to spend the summer helping her repair the family’s beach house, Still Waters. While Cora Anne organizes family photos, she discovers more mysteries than answers about her family’s past. With Nan prodding her to spend more time with the handsome, talented, and compassionate Tennessee Watson, Cora Anne begins to let go of her guilt and her fears. She encounters what truly matters in life, and realizes all the rest is as fleeting as a sand castle built at low tide. Haven’t heard of this author? Don’t let that stop you from checking out this book. If you like stories about families, the South, and the beach, I think you just might love this book as much as I did. Cora Anne is dealing with guilt and frustrations, but don’t we bring a lot of that on ourselves. It was interesting watching her work through the situations in her life. I love the characters in this book. Nan is a southern lady who leads her family. Y’all just might be able to relate to one of mor Haven’t heard of this author? Don’t let that stop you from checking out this book. If you like stories about families, the South, and the beach, I think you just might love this book as much as I did. Cora Anne is dealing with guilt and frustrations, but don’t we bring a lot of that on ourselves. It was interesting watching her work through the situations in her life. I love the characters in this book. Nan is a southern lady who leads her family. Y’all just might be able to relate to one of more characters that I hope you love as much as I do. I felt I was right there with them, in good times and bad. I hope you’ll check this book and author out. Still Waters is such a good book. It will be one of my favorite books. I cried and cried. The characters are real and emotional. The book delves into secrets, division and love! One of my favorite hymns is used as a calling point for all people. Come Thou Fount of Many Blessings! I recommend this book to anyone that loves a great story. I absolutely loved this story and the characters of Edisto Beach, some of whom are too entrenched in secrets, past tragedy, and fear to move forward with their lives. But in the same place that took so much, they can also find forgiveness and a fresh start. Still Waters is a beautiful story of second chances with a redemptive thread. It leaves me wondering and hoping that there will be a sequel. Still Waters invites you to sink into the serenity of Edisto Beach. On this picturesque island forgiveness is as warm as the summer sand, grace swirls as gentle as the tide's ebb and flow, and love is as healing as the salty sea breeze. This stunning debut from author Lindsey Bracket promises rich stories to treasure for years to come. I love books where the setting is almost a character. And in Lindsey Brackett's debut, Still Waters, Edisto Island definitely qualifies. It seems to breathe life around the main characters of Cora Anne, her grandmother, and Tennessee, the hometown boy vying for Cora Anne's heart. I also love a book that is so descriptive that I can picture everything and everyone precisely in my head, and this hits that nail on the head for me, too. There aren't overly long passages about nature or anything, but I love books where the setting is almost a character. 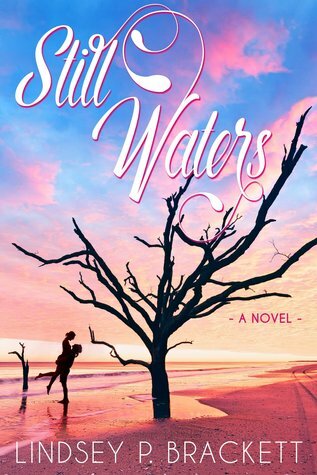 And in Lindsey Brackett's debut, Still Waters, Edisto Island definitely qualifies. It seems to breathe life around the main characters of Cora Anne, her grandmother, and Tennessee, the hometown boy vying for Cora Anne's heart. I also love a book that is so descriptive that I can picture everything and everyone precisely in my head, and this hits that nail on the head for me, too. There aren't overly long passages about nature or anything, but enough descriptives that I could see the whole beach house, the restaurant, the moments. Just love that. Brackett's novel is filled with complex familial relationships that are just as important to the novel as the romance factor. Cora Anne lives with several tragedies hanging over her head, including her parents' divorce a few years prior. She's tried to block everything out with practicality but the enchantment of Edisto and a persistent grandmother can't help but start to peel back her layers. This didn't have any of the ridiculous aspects that some Christian fiction does. Brackett has truly nailed it with making this feel true to life in the romance as well as the spiritual aspects. My only brow furrow was that I didn't feel that I understood all the family history by the end of the novel. But I've seen Lindsey talk about a sequel, so I hope she means to keep exploring those old relationships. Cora Anne Halloway wants to avoid her past. When her grandmother requests she spend the summer at Still Waters, Cora resists. At her mother's insistence, she goes. The setting at Still Waters, although seemingly perfect brings back bad memories for Cora. She pushed her toes into the warm sand. Anyone would love to spend a summer at this beautiful place, everyone except Cora Anne who had to resolve her past or live with it for the rest of her life. Romance: Tennesse offers Cora friendship. First, s Cora Anne Halloway wants to avoid her past. When her grandmother requests she spend the summer at Still Waters, Cora resists. At her mother's insistence, she goes. Romance: Tennesse offers Cora friendship. First, she must get past her guilt. I enjoyed this "clean" read. The romance-pure. I loved that. The story kept me curious and the characters were interesting. From the start, a hint at something hidden played out on the pages. Not every old picture tells a story - or does it? In between readings, I found myself drawn back to the story, thinking about the characters. A beautiful story about familial love and forgiveness, Still Waters caught me from the first page and held on until the end. This is a debut novel, but the author's skill with words and her nuance for character and the emotions of the heart were so well done. Cora Ann, her parents, Grandmother Nan, and especially Tennessee are memorable characters who came alive on the page (and I'd love to read more about--hint, hint). I appreciate God's grace shown through story, and Still Waters is a lyrical e A beautiful story about familial love and forgiveness, Still Waters caught me from the first page and held on until the end. This is a debut novel, but the author's skill with words and her nuance for character and the emotions of the heart were so well done. i loved this story and wasn't ready for it to end. And yet, it ended so perfectly. Before that though, the story made me feel at home with the characters--the setting is so real and the characters such a part of it. A beautifully written story of grace, forgiveness, and love, this debut novel is a must-read for everyone. I am a Yankee transplant who has lived over 30 years in the South - long enough to appreciate that religion is wrapped around everything and prayer is served with every meal. On the night of September 11, 2017, Hurricane Irma was screaming around my mountainside home. She had already cut the power to the house and I found myself reaching for something to read. I remembered I had a debut novel written by a local author on my Kindle. I lit my oil lamp and I read Still Waters while monster trees we I am a Yankee transplant who has lived over 30 years in the South - long enough to appreciate that religion is wrapped around everything and prayer is served with every meal. On the night of September 11, 2017, Hurricane Irma was screaming around my mountainside home. She had already cut the power to the house and I found myself reaching for something to read. I remembered I had a debut novel written by a local author on my Kindle. I lit my oil lamp and I read Still Waters while monster trees were crashing all around my home and I feared for my life. It proved to be a good choice on a bad night. I was thrown off-guard by the cover of Still Waters - the image of a loving couple embracing on a beach. I was right to assume the book has the central love story - the typical story filled with conflict and tension that ends with happily ever after. But there is so much more - family dysfunction, friends, healing faith in God, forgiveness, and the final mystery - death. Still Waters depicts humanity in all its imperfections and insecurities. We mere mortal humans are gifted with free will and will freely make both good and bad life decisions; but we do not have to be defined by our mistakes. The free will that allowed us to falter also allows us to pick ourselves up and begin again. Cora Anne, now an adult, was scarred by a terrible decision she made as a child that resulted in the drowning death of a family friend. Unable to forgive herself, she now lives an unfulfilled life always running from the memory that follows her like a shadow. Choosing to see herself as unworthy of love and attention, she shields herself from the affection and joys of life by deflecting and rejecting the things in life that would make her whole. Looking inward, has also kept her from seeing the humanity and needs of those that love her. Cor has just graduated from college and has been wait-listed for her graduate program in the fall. Her grandmother, Annie (Nan) has requested she spend the summer on Edisto Island helping her restore the family's ocean-front cottage in preparation for an upcoming family reunion. Edisto Island, the scene of her worst nightmare. The last place on earth she wants to spend the summer. Reluctantly she agrees to return to the island to help. My favorite character is Grandma Nan. This feisty lady is dying but no one knows it. She has set the stage to reunite the fractured family and to bring them home in time to spend her final days surrounded by those she loves. The gruesome scenes of facing cancer head-on are tempered with Nan's acceptance and readiness to join her beloved Thornton in the afterlife. The setting of Edisto Island and the ocean are key to the novel. The ocean within each person, the rolling emotions, are calmed by the healing nature of the slow paced life on the island and the unencumbered solitude of Botany Bay. In Still Waters, Ms. Brackett hits the bulls-eye describing the restorative and spiritual nature of the natural world. I encourage all lovers of Clean Reads and Christian Fiction to take the long slow ride onto Edisto Island where life travels on "island time". Still Waters by Lindsey P. Brackett was my book club’s selection this month. I chose this book because of the Southern island setting that I knew would suit our club’s anniversary. A good beach read for a late Summer book getaway is what I was expecting. I certainly got that, but I didn’t realize I would also get a book that as one member put it was way more than fluff. Romance is definitely a part of the book’s appeal, but Still Waters, with its emphasis on family, faith, and forgiveness, is a Still Waters by Lindsey P. Brackett was my book club’s selection this month. I chose this book because of the Southern island setting that I knew would suit our club’s anniversary. A good beach read for a late Summer book getaway is what I was expecting. I certainly got that, but I didn’t realize I would also get a book that as one member put it was way more than fluff. Romance is definitely a part of the book’s appeal, but Still Waters, with its emphasis on family, faith, and forgiveness, is a book that will get you thinking. So sit back in your rocker with a glass of tea and be prepared for a book that will speak to you about reunions and reclamation (in more ways than one). "Still Waters" by Lindsey Brackett is one of those books that is really a good book but is really filled with too much reality. I am going to include my Facebook post I post about this book, "Ok, I am so ready to quit reading, yes you read that right, books are getting to be more realistically and not an escape anymore, means they are full of cancer, death and all the real issues of life, maybe it wouldn't be so bad if all these things wasn't in one book but the book I am reading now has it all, "Still Waters" by Lindsey Brackett is one of those books that is really a good book but is really filled with too much reality. I am going to include my Facebook post I post about this book, "Ok, I am so ready to quit reading, yes you read that right, books are getting to be more realistically and not an escape anymore, means they are full of cancer, death and all the real issues of life, maybe it wouldn't be so bad if all these things wasn't in one book but the book I am reading now has it all, cancer and fears and death and even having a grandfather dying from a massive heart attack and one of the main characters is named Lou and one is name Hannah, just too much reality lately. Ok I have too say I have only read 71% of the book and the book is great, but once again #toomuchreality " I have finished the book and again I say it is good but all these issues have hit home. This book made me miss my own grandma more than I already do. And no, I am not going to stop reading, that was just a fleeting thought. I am giving the book five stars, I know it might seem weird with the above statement but the book was really written well and some of the story is history based. There were a couple of scenes that I laughed out loud while reading such as when Cora Ann was talking about her brothers getting into her black fingernail polish because they were Indians. The book is about Cora Ann learning to forgive her self. Even with the too much reality I would still recommend this book with the warning , have tissue available because you will need them. I was surprised at the ending, It really didn't end I was excepting it too, but I am not going to say if I liked it or not. You will need to read the book and then we discuss if you agreed with my opinion or not. I was given a complementary copy by the author and these opinions are my own. Definitely five stars. Cora Anne Halloway has a mapped out plan for her life. But when a roadblock is tossed in her way, her Nan offers her an alternative Cora Anne can’t get excited about. Returning to Edisto Beach, a place where so many things went wrong in her life, seems more of a nightmare than an opportunity. Yet the lure of financing for graduate school lures her to the place she’s avoided for a summer of helping Nan organize the beach home. A summer that just might possibly heal all the hurt Cora Anne has harbo Cora Anne Halloway has a mapped out plan for her life. But when a roadblock is tossed in her way, her Nan offers her an alternative Cora Anne can’t get excited about. Returning to Edisto Beach, a place where so many things went wrong in her life, seems more of a nightmare than an opportunity. Yet the lure of financing for graduate school lures her to the place she’s avoided for a summer of helping Nan organize the beach home. A summer that just might possibly heal all the hurt Cora Anne has harbored for years. Lyndsey Brackett portrays Cora Anne’s fears, hurts, and remorse throughout this story. And each time the main character released a bit of her past, I rejoiced with her. This family is so real. A mixture of chaos with three pre-teen triplet brothers, dysfunction with Cora Anne’s divorced parents, and fun with a cousin who shares a birthday and is more like a sister. Then there’s Tennessee Watson. A man who has every reason to hate her but continues to show up. To draw her out. This book drew me in and sat me down like a member of this family—both the blood relations and the community kind of family—and reminded me that while hurting is okay, letting it define the rest of my future is not. God forgives and forgets our sins and mistakes. How can we do any less? Brackett's debut novel isn't one to miss. These characters are written with so much depth to their lives that you'll be amazed how many feelings she fits into one book! I will admit it took me a little bit to get sucked in because I wasn't sure what some of the issues Brackett was alluding to were. But once I started to piece together those issues it wasn't a matter of understanding the backstory but figuring out how the characters were going to overcome all their complex issues. This book is full Brackett's debut novel isn't one to miss. These characters are written with so much depth to their lives that you'll be amazed how many feelings she fits into one book! This book is full of hurt and painful pasts to a level that makes it very easy to relate to. The character's sufferings were hard but not unlike what people deal with everyday. I appreciated the realistic lives they led. I also really appreciated the overarching theme that people can overcome past hurts and experiences. I also loved that no one in this book was perfect. Sometimes fiction can make characters' lives too easy and that gets old fast. You won't find that in this book. The main theme of this book is not the romance but the scenes that involve romance are quite good. I really liked Tennessee a lot. He was such a sweet guy and I loved how patient he was. I found myself getting excited whenever he was in a scene. I always love books that focus on forgiveness. It is such a difficult thing but causes so much healing when it is given and received. The author sent me an advanced copy of this book. This review is my honest opinion. When I saw that this book was about a girl and her grandma, I knew it was one I wanted to read. I didn’t realize just how much I’d love it. I was always a grandma’s girl, so books about girls and their grandmas are for me. Cora Anne doesn’t have the best relationship with her family. They’ve been through a lot, and a lot of what Cora Anne went through happened at Still Waters. She only goes because she feels like she doesn’t have much choice. Her Nan asked for her help, so she can’t turn her down When I saw that this book was about a girl and her grandma, I knew it was one I wanted to read. I didn’t realize just how much I’d love it. I was always a grandma’s girl, so books about girls and their grandmas are for me. Cora Anne doesn’t have the best relationship with her family. They’ve been through a lot, and a lot of what Cora Anne went through happened at Still Waters. She only goes because she feels like she doesn’t have much choice. Her Nan asked for her help, so she can’t turn her down. What Cora Anne doesn’t expect is Tennessee Watson being there as her Nan’s handyman no less. Tennessee Watson brings back a lot of bad memories for Cora Anne because the bad thing that happened at Still Waters affected his family too. Cora Anne expects Tennessee to hate her, but when she arrives she finds the complete opposite. Cora Anne has a difficult time being at Still Waters and accepting that she wasn’t at fault for what happened so many years ago. Since she can’t forgive herself, she can’t see how others have forgiven her. What she doesn’t realize is that how she remembers the event, isn’t exactly what happened. She’s spent years hurting. Will she accept forgiveness and forgive herself? Wonderful! This story pulled me in quickly and never let go. It's not a suspense or crime story, but still a page-turning story of family, faith, and forgiveness. Cora Anne is buried under layers of guilt, fear, and hurt. As the tide ebbs away the shore, the beauty of Edisto Beach and the love she finds there wash away the pain and help her learn to live again. There is romance in the form of Tennessee Watson, a man you'll fall for as quickly as Cora Anne does. He is the perfect anecdote for her Wonderful! This story pulled me in quickly and never let go. It's not a suspense or crime story, but still a page-turning story of family, faith, and forgiveness. There is romance in the form of Tennessee Watson, a man you'll fall for as quickly as Cora Anne does. He is the perfect anecdote for her troubled soul, as Cora Anne's grandmother "Nan" knows for a fact. But that's not all this story entails, as Nan herself has her own secrets to keep. And there's Cora Anne's relationship with her mother - another situation that needs much healing. I have loved reading this book! The setting is wonderful. It has made me want to go to Edisto and visit. This story felt like home to me. I felt like I knew the characters and what they were going through. It made me think of my own southern childhood and all the memories I had of summers growing up with my cousins. I loved the fact that Lindsey named her leading man Tennessee. That's where I grew up so it struck a chord with me. He is a fabulous character too. I loved that he was so forgiving a I have loved reading this book! The setting is wonderful. It has made me want to go to Edisto and visit. This story felt like home to me. I felt like I knew the characters and what they were going through. It made me think of my own southern childhood and all the memories I had of summers growing up with my cousins. I loved the fact that Lindsey named her leading man Tennessee. That's where I grew up so it struck a chord with me. He is a fabulous character too. I loved that he was so forgiving and accepting of Cora Anne even when she couldn't forgive or accept herself. And speaking of Cora Anne, she is such a relatable character and I love her name too. This book will touch your heart. You won't be disappointed. I can't wait to read more from Lindsey. You definitely need to get this book. It's southern fiction at its finest! It's been decades since I was on Edisto Island, but the author captured it so well, I was right there, again. Southern families have secrets and they usually have some serious emotional baggage dating back generations and it does damage almost everyone. I'm giving this 4 🌟 for knowledge of subject, character shaping, although it must be said, this was the longest "hissy fit" I have slogged through, but I'm old and cranky. From the first page, Still Waters was a book that I did not want to put down! The story is beautifully written, taking you on a journey of love, loss and forgiveness. As you read, you're immersed in history, family and self discovery all while embracing the beauty of Edisto through Lindsey's words. Still Waters will make you laugh, cry and appreciate the little things in life. Wonderful story! The characters are well developed. The story line, dialogue and settings are so well done I wished I lived there and they were my family. The flow is smooth and the dynamics between the characters is perfect! I will be following this author! OUTSTANDING! Highly recommend!